NOINO has conquered one more frontier. This time it is Surat division in Western Zone. NOINO has been successful in hoisting the BMS flag for the first time in Surat division. For those who have been observing & following NOINO’s activities, this should not come as a surprise. Such successes have been achieved purely on the basis of NOINO’s diligence, dedication & doggedness in pursuing the issues of the Class I Officers. 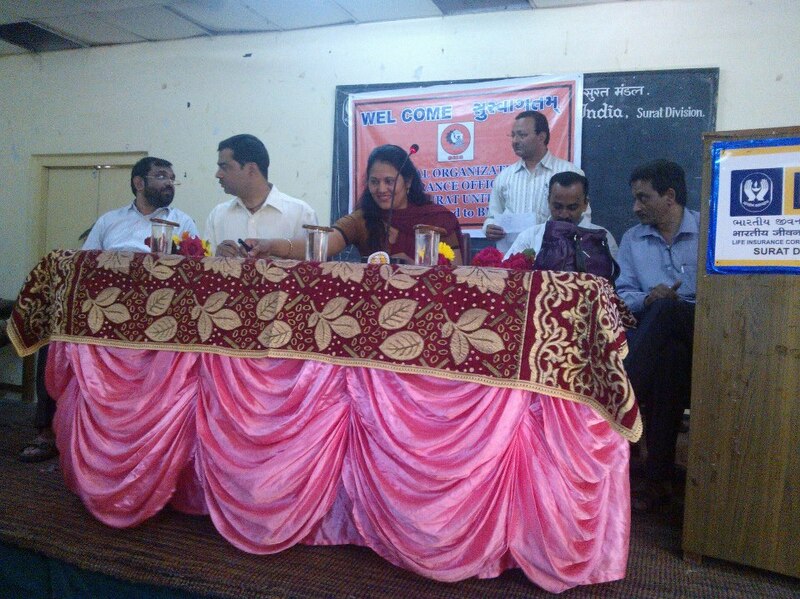 In a simple affair, the Surat unit of Class I Federation affiliated itself with NOINO on Sunday, 23rd December 2012 in a Special General Meeting called specially for this purpose. Smt. Anagha Sant, GS, NOINO; Shri Ganesh Kamath, Chief Advisor, NOINO; Shri Dattaraj Prabhukhanolkar, Resident Secretary, NOINO; Shri Vishwas Shastri, GS, NOINO WZ unit; Shri Anil Bhagdikar, President, NOINO WZ unit; Shri Amit Vaidya, VP, NOINO, WZ unit; Shri Ram Vadalkar, GS, NOINO Vadodara unit were present on this occasion. The SDM of Surat, Shri Girish Kumar was also present on this occasion. More than 100 officers attended the meeting. The historic special general meeting started with a resolution announcing the decision to affiliate the Surat unit of Class I Federation to NOINO. The resolution was passed unanimously amidst thunderous applause. Shri Malcolm Bhathena, GS of Class I Federation Surat unit explained why it was felt necessary to affiliate the unit with NOINO. He said that the entire officers’ community in Surat was impressed by the activities & achievements of NOINO. Shri Bharatbhai Parameshwarwala, President of Class I Federation Surat unit also spoke on the occasion. He informed that 135 officers had already paid their subscription. In addition to these, many officers also paid their subscription on the spot. Many officers also spoke their minds. Most of them said that the Class I Officers in Surat were reeling under intense bulldozing tactics & humiliation by the divisional management. Speaking on this occasion, Shri Vishwas Shastri, GS, NOINO, WZ unit spoke about the achievements of NOINO. He said that the WZ unit would be always with the officers of Surat & take care of their problems at all levels. The Senior Divisional Manager, Shri Girish Kumar, said that the customer of LIC was our GOD & it was our sacred duty to serve him / her at any cost. He wished the newly elected Surat team of NOINO all success. Our ex-Zonal President Shri Vilas Purkar also spoke on this occasion. He said that BMS always believed in the slogan “Desh ke hith mein karenge kaam, kaam ke lenge poore daam” & said that all BMS activists always made a conscious effort to contribute towards the prosperity of the industry. The GS of NOINO Smt Anagha Sant guided the assembly. She said that the officers should have self-belief since it was mainly because of their hard work that the Corporation had reached such heights & also because they were selected as officers due to their meritorious works. She also appealed the lady officers to come forward & play more important role in the union activities. Shri Ganesh Kamath, Chief Advisor, NOINO gave the concluding speech. He congratulated the assembly for taking a historic decision of affiliating with NOINO. He said that according to Swami Vivekanand, fear was the greatest drawback of a human being & once this fear was overcome, it was possible to conquer everything. He said that the Central leadership of NOINO including our President Shri Prakash Javadekar was keeping a close watch on all divisions of LIC & insults of any Class I Officer would not be tolerated. He assured the officers of Surat that NOINO would take up all matters pertaining to Surat with the Zonal & Central management. The vote of thanks was given by Shri Bharatbhai Parmeshwarwala.